Martini history is garnished with witty stories, like the people that drink it. Concocted by a Dutch MD to relieve kidney disorders and purify the blood, it’s origin traces to England, New York and San Francisco. Learn how the martini got its name. The martini owes its heritage to gin, a mixture of grain alcohol and juniper berry oil. Gin was originally concocted by a 17th century Dutch medical professor named Francois de Boe Sylvius to relieve kidney disorders and to purify the blood. Gin also treated stomach aches, gout and gallstones so it is easy to imagine how popular “genever” was, especially since it gave the drinker a nice buzz. Genever, the Dutch word for juniper, or gin was also pretty tasty and cheap and easy to produce. The accomplice to gin in the making of a martini is vermouth. Vermouth is an old drink, borne in the 1700’s in Italy. Oddly, its name is a German derivative of the English word for wormwood: welmut, a remedy for intestinal worms, jaundice and rheumatism. Vermouth is a different drink today than it was in those days. Back then, vermouth was a sweet red dessert drink that was believed to hold special healing powers. Drinking it also meant that Europeans could forego drinking their own polluted water. It was made from a blend of juniper ( derivative of gin), workwood flowers, orange peel, cloves, cinnamon, nutmeg, coriander, mace, marjoram, brandy, white wine and tree bark. Interestingly, vermouth’s first visit in the US was to apothecary shops. Today, vermouth - whether sweet, dry or half-sweet – is really white wine infused with special herb and spice blends, alcohol, sugar and caramel. The martini, through the years, has been referred to as a martinez or martine yet its pungent, trance-like taste and look remained constant: sweet taste and straw-like color. By the time the 20th century rolled around, the martini was only referred to as the martini and its look was transparent because it was made of 1 part gin and 1 part dry vermouth. As refrigerators began to replace ice boxes in the 20th century, gin began to dominate the martini by 2:1. There are as many storied origins of the martini as there are ways to make one. Some believe that a New York bartender named Martini invented the drink in 1912 while some believe it to be invented in San Francisco by Professor Jerry Thomas around 1850 for a miner on his way to Martinez, California. Lore says that a miner placed a nugget of gold on Jerry’s bar and challenged him to concoct something special. The result was the Martinez, the said prototype of the Martini. The Martinez was first published in The Bartenders Guide in 1887, the first bartenders manual of its kind and was made with a full wine glass of sweet vermouth, one (1) ounce of Old Tom Gin, some bitters and a dash or two of maraschino. In those days, if the drink weren’t sweet enough, gum syrup was added. The citizenry of Martinez, California believe that the martini was first concocted right there in Martinez by a bartender named Julio Richelieu in 1870. They claim that a miner became disenchanted with the whisky Richelieu served him. After all, he paid for the whisky with a pouch of gold. So, Richelieu concocted a glass of gin, vermouth, orange, bitters and an olive to make up for the difference. Thus was born the Martinez. The Oxford English Dictionary credits Martini and Rossi with the martini. In 1871, the company, then named Martini e Sola, shipped 100 cases of red vermouth to New York. Unfortunately, this was 20 years later than Jerry Thomas’ concoction and a full year later than Richelieu’s serving to a disgruntled miner. The British think the martini is derived from a British-made rifle called a Martini & Henry used by the English army between 1871 and 1891 because of its kick. New Yorker’s insist that a bartender at the Knickerbocker Hotel named Martini di Arma di Taggia invented it in 1911 for John D. Rockefeller. True or not, it seems to be the first time the martini forged its way into Wall Street and big business lunch deals. Incidentally, Rockefeller took his martini with London Dry Gin, dry vermouth, bitters, lemon peel and one olive. Some think it was first discovered in Martinez, California while others believe it was invented by a 19th-century Italian chef in London who named it after his grandfather. Of course, the Smirnoff Company, with a rich vodka history, was the first to mass market vodka in the United States in the 1930’s. Smirnoff sold its brand to Heublein who then sold it to Diageo who markets many other beverage brands such as Guiness, Captain Morgan, Crown Royal, J&B, Seagram 7 Crown, VO, Johnnie Walker, Tanqueray, Bailey’s Irish Cream, Bushmills and Lagavulin. How to Make a Martini? Add the gin, vermouth and peppermint schnapps together into a cocktail shaker which is filled halfway with cold, cracked ice. Shake well and then strain the delicious mixture into a chilled cocktail glass. 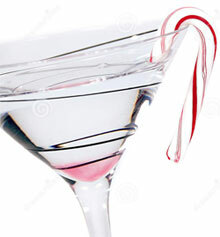 Hang the small candy cane off the side of the rim and voila - you have the Burl Ives' Holly Jolly Christmas Martini. We take from the Greeks in our celebration of the fall/autumn season with the Baklava Martini. The closest ting to eating this delicious Greek dessert. Combine amaretto, gin, creme de cacao, simple syrup, and cinnamon in a cocktail shaker full of ice. Shake the mixture together and then strain it all into 2 martini glasses. Perfect for Spring and Mother's Day. Hemingway may even have tried one! Muddle infused vodka, 2 lemon wheels and mint sprig. Strain into a tall glass with ice and top with soda water. Garnish with a cucumber strip and lemon wheel. "a few weeks ago my wife and I were in San Francisco and stopped in Lefty O'Douls for drinks... she had a SKYY infused pineapple martini that she loved... I've looked all over for a recipe and can't find one...do you know of any?" Well, JC, we were wondering how Lefty O'Doul's made their Pineapple Martini also so we called them. We spoke with Chuck Davis, the Manager/Bartender. He was the bartender who made your pineapple martini. Step 1: start with vermouth; measure 1 part, drop a few drops in a chilled cocktail glass; rotate the glass so that vermouth is spread on the glass walls. Pour rest of the vermouth left in the measure glass in cocktail shaker. Step 2: Add 2 parts vodka to the cocktail shaker. Step 3: Add 3 part gin to the cocktail shaker. Mike Sherwood of Santa Rosa Spirits writes The Muse that he's been experimenting with two infusions from Sub Rosa Spirits. Nothing radical and, that he says, is the point. He likes mixing Elderflower Liqueur with Tarragon Vodka. The Saffron and Cointreau seemed destined as partners, "very lush and warming", he says. Mike adds a hint of fine freshly ground black pepper into a plain Tarragon martini. Grinding in white pepper also works well. The martini is meant to be understated which brings out the delicate flavor of the tarragon. Combine all ingredients into a martini glass over cold ice - check out Swank Martini Glasses for a nice selection of classic, cool and artsy martini glasses - and shake. The elderflowers bring imagery of a fresh summer meadow at sunrise. The Meadow Lark is Oregon's state bird. The Marseille Airport Martini may require 1-2 ounces of ginger ale or a juice of your liking. The weekend bartender at Serattos make this one with a little soda water mixed in. Soda cut the sweetness of the orange liqueur but need to play with this one a little more. The Marseille Airport Martini has a pale yellow orange cast to if from the Saffron vodka and Cointreau. The aroma is warm and familiar yet not completely identifiable due to the toasted cumin wafting over the orange liqueur and fresh lime. Think Golden Cosmopolitan minus the juice. Combine ingredients in a cocktail shaker with cracked ice. 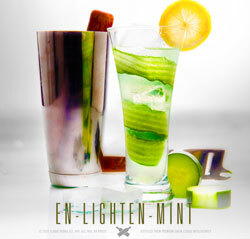 Shake and strain into a chilled martini glass and garnish with a long twist of lime. Copyright © martinimuse.com All rights reserved. Website Design by Lancer Media, Inc.